While Uber isn’t exactly driving straight to the bank, it may get there yet. The company has ripped through $10 billion to date, but its latest report (Q1 2018) is sufficiently rosy for investors to buy into a $62 billion valuation. How rosy? Uber is losing lots of money, but only half as much as it did in the first quarter of 2017, a ground-rule double for Silicon Valley. Digging a little deeper, however, these financials reveal a disquieting fact: While the company’s 2017 earnings were up 70% over 2016, its bookings (total income from rides driven) increased by only 55%, a disparity which suggests that Uber sliced away yet a larger share of the pie for itself, cutting into its drivers’ already meager earnings. To this point, the Center for Energy and Environmental Policy Research at MIT determined in a March 2018 study that Uber has achieved its success the old-fashioned way, that is, on the backs of its workers. The MIT paper concluded that 74% of Uber (and Lyft) drivers earn less than the minimum wage of the state in which they drive. Uber, however, immediately challenged the MIT findings and, somewhat surprisingly, MIT conceded that its methodology might be flawed (a few key survey questions were unclear) and that different approaches to the same data suggested that Uber drivers earn somewhere in the $8-10 an hour range. MIT asked Uber to release its own internal data to decide the issue, but the company has apparently refused. While this debate should remind us that ivory tower business studies ought to be viewed with the skepticism accorded papal bulls, this paper is buttressed by the fact that, depending on which unreliable internet source you believe, somewhere between 50% and 96% of all Uber drivers quit every year. But put aside its drivers’ plight for a moment, take a deep breath, and simply acknowledge that Uber is the best thing to happen to transportation since Henry Ford, with the company’s service being to a taxi what a bicycle is to walking. Uber is a runaway success for its users and, in their myopic view, practically perfect just the way it is. The company does have a great product and should be highly successful, but its foundation is bad concrete. A pier can be immaculately paved and dotted with sunny restaurants and colorful seashell shops, but if its pilings are rotten, it’s going to drop into the sea. Uber cannot make the transition from promising start-up to stable cash machine with a critically underpaid workforce. Uber could shore up its underpinnings by cutting a new deal with its drivers, by allowing them to recover their actual costs of driving and a minimum hourly wage before the company takes its 25% share of the gross. It could be a company that not only provides an excellent product, but a great one for which to work (e.g. Costco). A living wage would, however, wipe billions away from the company’s market value, rendering the likelihood of such a transition on a par with Elon Musk actually colonizing Mars. Or, in the alternative, the company could raise its rates high enough to provide a decent wage under its current revenue-sharing structure. A tad more likely than the previous scenario, this approach still has the drawback that bedevils the entire e-commerce industry, that is, if you charge enough to actually turn a profit, your volume will plummet. And it is the antithesis of Uber’s current global strategy of buying market share through predatory, loss-leading pricing. Viewed a bit too simply (the way your correspondent once did), Uber might be likened to a three-legged stool comprised of customers, drivers, and the company. A second look suggests a fourth leg — the environment, the cities in which ride-hailing companies are jamming the streets — and why reducing their ubiquity, whether voluntarily or through regulation, may be a good thing. According to the Chicago Tribune, a typical San Francisco weekday has ride-hailing drivers making more than 170,000 vehicle trips, about 12 times the taxi trips, centered of course in the city’s worst congestion. And the American Public Transportation Association’s latest figures show public transit ridership has declined 2.9% during a time when ridership, which follows jobs, would otherwise have been expected to soar; if Uber is cheap enough, people hop off the bus. Raising rates would benefit drivers and de-clog downtowns a bit as well, but inasmuch as this would come as a major sideswipe to the net worths of its founders, the likelihood of Uber doing this voluntarily is — using the Musk scale — on par with Elon actually making a go of Tesla. Hollywood-inspired or not, Uber boldly declared the launching of a fleet of autonomous cars more than three years ago. But that fleet thus far has gone the way of the Spanish Armada, producing nothing but grief, with the March 2018 pedestrian fatality in Arizona forcing the company to put the program on hold, suspending all testing. 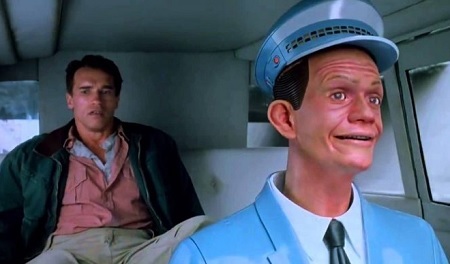 Had they paid a little more attention to the movie — especially the part where Johnny Cab goes out in a fully-autonomous fireball courtesy of Arnold Schwarzenegger — the Uber overlords might have decided to save the billions they spent on self-driving technology, let someone else tinker with Johnny Cab and simply give their drivers a raise. By John E. McNellis, author of Making It in Real Estate: Starting Out as a Developer. The article was first published on The Registry. Since Uber controls the rate structure, drivers will never get a fair wage out of the system. Uber can make their 25% cut look low by keeping the rates low as well. The only way for drivers to get fair rates is to go to an auction system for the call, much like advertisers bid for ad space online. Every driver should be able to see who is bidding and how much. The customer can then decide if they want to book the trip. Then don’t drive for Uber. In theory that might work. In practice, I would like to share my experience with online auctions for ads — since that’s where part of my revenues come from: There is nearly unlimited and rapidly growing supply of global web pages that all compete for ads. And there are now over 3,000 such ad exchanges active in the US. Ad exchanges, various layers of middlemen, platforms, and ad agencies all take a cut. But there is limited supply of ads, and that supply is growing only slowly. This has had the results that auction prices that the publisher receives “per click” – just to name one of the common methods – have plunged over the years. It is forecast that they will continue to plunge. As a result, advertisers (the companies promoting their goods or services) pay more and more. The middle (Google, ad exchanges, platforms, middlemen, etc.) take an ever larger cut, and publishers get less and less. This is one of the reasons the publishing industry had trouble making money with online ads. Publishers have largely lost control over the process, the rates, who decides who gets paid what, etc. If this is how it would work for drivers (with drivers being the equivalent to publishers), it might turn out to be even worse than it is now. The auction system is not a perfect system but the drivers can set a reserve to avoid going below costs. The other alternative is for the drivers to set their own rates like they do on Airbnb. If drivers are going to be independent businessmen they need to know and deal with what their product is worth in the marketplace. The proper way to set rates would be to crunch the numbers on expenses (mileage compensations for car owners, wages, insurance, tech upgrades/ maintenance, etc), then find a minimum operating budget that covers those numbers with an rate to cover those expenses, profits will increase if ride share increase, and profits will fall if usage falls. Sadly this is already a practice in use, by taxi companies. Honest companies are getting shafted in this free credit society of spoiled brats. Use Uber and support this cancer on society, they will be the blue print for future companies to show they can walk on lower class citizens with the right spin. Try explaining this business model to the New York City Taxi and Limousine Comission. Where we have over 200,000+ for hire vehicles (Uber, Lyft, Juno, VIA and others) Cars must belong to a base, base sets the rates, etc, etc. You people have no idea what you are talking about. Just fantasizing like kids. Anthony, glad to hear your input. I think Pairies, comment is valid and it seems if Uber cut its margin, it would let drivers earn more, right? The issue is, Uber is triying to supply the masses and the numbers dont work..
Scott, I don’t think Uber is being so noble as to just “supply the masses”. They are aggressively trying to take the taxi industry down and take its place. I don’t like Uber because what I see is one big bully fighting to take the role of a different big bully. Not one party out for the common good, just their own greed. that is an excellent, free market idea . extend the concept to law and dental services among others. but transportation needs would be greatly diminished if it were not for our byzantine zoning laws and NIMBY attitude. The “at home” delivery models and ride hailing are a zero sum game in regard to reducing traffic congestion. Uber could couple up with bezos and use the ubiquitous Uber drivers for Amazon delivery’s. Petunia, Hubert Horan wrote a series of articles about Uber and its business model which can be found in the archives of the “Naked Capitalism” Blog. To put it as simply as possible Uber can not achieve profitability without establishing a monopoly and then substantially raising prices. Uber has two genuine assets, a brand that is widely recognized and the data it has acquired from its customers. Horan’s articles are the definitive takedown of the Uber scam, and required reading for anyone who wants to understand the economic fallacies behind so-called “ride sharing” services. Basically, all Uber is, is a glorified internet dispatch service that squats heavily in between riders and drivers, and extracts monopoly-style rents that are grossly out of proportion to the value they deliver. Furthermore it exploits the economic ignorance of drivers, the overwhelming majority if which can’t do the basic accounting necessary to determine the economics of the business they are in. The only clear winners are the riders, who are on the receiving end of a massive transfer of wealth from Uber investors. Uber is just one of the many symptoms of our sick, sick political economy. The paste is out of the tube. Taxis are dead and drivers are nothing more than victims of capatilism’s relentless drive towards low to negative margins for fiercely competive forces that squeeze everyone and business in its path. The only opp Uber has to boost profitability is to eliminate competition. Lyft being #1 and a few European upstarts. Beyond that there is little value in connecting rider to driver using a smartphone short of the value of availability and loyalty. With a taxi in major city once you actually hail a taxi, who knows if they are taking you a good route or a long route to run up the fees. And it seems the taxi drivers are often on some sort of telephone chat bridge or something where they all chatter away to each other in foreign languages. Or whoever they’re always talking to on the phone the entire trip. Taxi cabs had monopoly control over the market, so they didn’t need to worry about service levels. Once competition hit, the market chose. Enter Uber (and Lyft) that solved a few of those things. When I’ve taken Uber in Chicago and DC if the driver received 70% of my bill then they were making more than minimum wage. this is it right there. The last time I took a cab the driver was slowing down at every green light in hops of getting the red and having to stop. I took a cab many times to a certain watering hole and the price was always about $15 bucks (it’s $6 in an uber) and this one time the cabbie was horrible, the cars were flying past us. He managed to get that fare to over $20. When I got out I told him he had no business driving a cab. Not all rides are the same. I have had both experiences, in Toronto a cab driver broke every law possible to get me downtown without me even offering a reason to do so. But I have had a cab go the wrong way in a small suburb and cost me an extra few minutes. I wouldn’t switch to Uber over that, unless Uber was offering the same product. I don’t trust Uber to upkeep the fleet so I don’t trust them to keep me safe. Most countries regulate taxi firms pretty toughly to protect the customer. Vehicles have to face tough testing; drivers have to have public service licenses including criminal records checks; insurance is far more comprehensive and costly than for ordinary motorists. Uber seems to sidestep all or most of this. Is that a level playing field? The taxi medallion or license to operate a Taxi can in most NA places, only be purchased in the private market. This was the barrier to entry; the other regs were trivial. The taxi driver was almost never the owner of the medallion. Uber was a response to a completely artificial shortage, which could only be recouped with excessive fares. It was a tax on the poor and still is because they don’t use ride hailing. The solution is to open the taxi privilege to new entrants within reason , with whatever regs you like. Then maybe we’ll see a few owner- operators. From about 1935 to 1980, just about the only way to get into the interstate trucking business was to buy operating rights from another carrier. The Interstate Commerce Commission, which regulated the business, issued very few new permits and prices for trucking services were not competitive. When President Carter signed the Motor Carrier Act of 1980 into law, operating rights were no longer required. Anyone could enter the trucking business if they had the necessary capital and could meet safety requirements. Operating rights became worthless. Taxi medallions, like the old trucking operating rights and a host of farming regulations were designed to prop up prices during the Great Depression. Perhaps Tim is from Europe? London is the quintessential example, those black cab drivers have to pass an English test, and ‘the knowledge’ a ln exam on the best routes of the city,not to mention basic background criminal checks. When you say black cabs I take it you aren’t referring to the color, but black as in ‘black market’ which means unauthorized but the ones you describe clearly are authorized. As a UK citizen of course I had heard of the test of ‘the knowledge’ but I understood it was a new requirement of existing cabs. If I’m wrong about that, and it and other basics are sufficient requirement for a new entry- great! I am all for requiring the basic rules you mention. My point is that in N America. the huge barrier to entry is the up to six- figure cost of the license (AKA medallion). This is what drives the Uber model, not the savings from avoiding basic regs. A whole separate finance industry had sprung up to fund these medallions, with big money folks holding multiples. I.e is there an artificial shortage? If so Uber and ilk aren’t going away. no but its cheaper and some consumers are willing to accept more risk than others…..should the government force an otherwise normal citizen to pay more for something he doesnt want or need? Freedom of choice means freedom to make bad choices too….criminal backround checks…..ok….I.get it….but government certifications, licenses, and just plain “fees”, not only increase the cost, but lower the service standards. Whatever company first produces autonomous cars will take the cake. Google or whatever tech company will just deploy their own fleet and cut Uber out. As such, I wonder how anyone could invest in a company like Uber (even if it made money) that has a shelf-life of, say, 10-15 years before that happens. It obviously won’t turn sufficient profit per share in that time to justify the original purchase price. Uber isn’t a tech company and they’re not going to beat one in AI. I ask every Uber driver what they think of the company and they all say something from ‘its fine’ to ‘good’. I then ask what they did before and get answers like ‘out of work’ or ‘warehouse’, people don’t compare their job to a perfect one or great one, they compare to what they had before or what they can get. So long as people go into a job voluntarily then l don’t think people will complain if it’s no good, they use the time looking for something better? The truth, more than likely, is they say its okay because you have control of them with the ratings scheme. Uber has everything set up for them and most riders to benefit. Sorry, it’s the truth, like it or not. When you are in Lyft ask the driver about Uber when in Uber ask him about Lyft. Same driver will flip the bad side on the other app. How does that saying go? Something about the (economic) law in its grandeur allowing the rich and the poor alike to sleep under bridges, beg for bread, scrounge through the trash, etc.? I think you’d find that in general Uber drivers are going to describe their situation as “better” because it’s generally desperation that makes them go drive for Uber in the first place. I have a friend who drives for Uber on the weekends in Atlanta, mainly when the demand is high so it’s ?rush? pricing and fees pay more. He thinks it is fun. He finds it interesting getting out of the house and talking to people. He uses the cash to pay for furnishings and maintenance on the house that he bought. He only drives when he feels like it, and says it beats watching TV. It’s cashless business. He will get annoyed soon. 95% of riders are Richards. The real problem is that there aren’t many barriers to entry – all one needs is a vehicle and a way of charging for rides. This is why cities went to the medallion system: too many operators meant nobody could turn a profit, leading to insufficient supply. The appropriate answer would be to take actions such as expanding the number of medallions if their sale price exceeds the median 6-month earnings of a driver, and freezing sales if the sale price fell below the 3-month median earnings. This way, supply would be restricted in a way that helps ensure drivers earn a living wage, while also ensuring against shortages. Of course, we could also simply conclude that the drivers are employees – and force minimum wage levels and expense reimbursement. What we don’t need is a wage-slave model, where the medallion owners (or the ride-hailing software company) have the power to extract unreasonable profits from the drivers. Municipal transit agencies offer their services below cost and have taxpayers pick up the difference. Transit employees are typically paid above market wages. When is the last time you saw a help wanted ad for subway station agents? Or require the medallion holder to be the driver. Now THAT would discourage the rentier class. If Uber drivers make $8-$10 per hour (and that number could likely be inflated), why don’t they just get a job at McDonald’s? They would incur less risk from both an economic and safety standpoint. The pay with Uber is somewhat mysterious, and I think they’re getting hoodwinked. RoseN – I agree. The math has been done over and over again, and it shows this. To me the only way Uber makes sense is if I had a day job, had a car, and wanted to pay for the car. But even then, I do better (not that much better, but better) than $8 – $10 an hour playing my trumpet, and I’m not that great a trumpet player by a long shot. It’s a gas playing, having the little kids dance around and the older folks nod, and the (drunk) college bros get with it, etc and know I’m making at least what an Uber driver or the pedicab drivers sweating away do. Up to two or three years ago it was basically “We hope some big company buys us so we can cash out”. I predict a new urban sport will be hunting and running off the road empty Uber Johnny Cabs. This race for the employment bottom reminds me of a lady I know who survives doing medical transcription. It used to be this was all done in house, and people were paid a wage to type out medical records. Now, contractors (who have a skim) sub-contract the work out to people who absolutely must work from home, and they are paid by the word. If she works really really hard, has no internet down time, and the doctor can be understood….she may make minimum wage. Most often she does not. Her last employer cut her rate so she now works for a new company. She expects the new rates to be cut as soon as pressure to reduce costs are downloaded onto the workers. Of course this is good for the customer. So is airline deregulation and rampant competition producing the cheapest flight possible. Just don’t whine about losing a loved one who falls out of the sky because of sub-standard maintenance or training. It’s the same for piecework uber drivers. You get what you pay for. What is at first seems such a deal might be something else, entirely. What does Uber even lend to the equation? All it would take is some disgruntled hacker to build an open share site for both drivers and riders to log onto…at maybe a $1.00 a pop. And Uber is finished. A pax waits by the road and a person needing a few bucks shows up in an unaffilated ride. But don’t complain if it’s Ted Bundy driving you to the airport at 1/2 the price of cab fare. Paulo – If your day is ever too cheerful, go visit the “beermoney” or “side hustle” sub-Reddits on Reddit. People are making a few dollars an hour, at most, doing various things online and actually bragging about it. Now, granted, that $5 or $10 they make in an afternoon can make a big difference. Maybe they don’t have a car, have disabilities that make it difficult or impossible to get around (and in the US, not having a car, in many places, is a disability) and maybe they’ve got a hungry kid or two. $10 will buy a dozen eggs, some bread or better yet a stack of corn tortillas, some greasy sausage and a head of cabbage. That’s a day’s food for a family of 4. I’ve been hearing that point about airline deregulation resulting in 737’s dropping like flies, obviously on kindergardens full of children… hundreds of times, literally. That the airline industry is now a financial minefield is granted, but need I remind that often State-owned airlines in the era of stifling regulations were just as bad with money? Alitalia, SABENA, Swissair… and let’s not forget Soviet-era dinosaurs such as MALEV. But safety? Commercial aircraft have never been safer. You may rightly complain about legroom, the lack of refreshments and the hidden tariffs but if a company tries to cut corners when it comes to safety their license is on the line. Finding MH370 has been deemed so critical for the simple reason the crash may have been due to some technical/weather issue nobody has thought about so far and which needs to be addressed. So far that tragic event has resulted in a series of measures aimed at improving aircraft tracking and the recovery of flight recorders (“black boxes”), albeit the call for automated transponders has been vigorously resisted by the whole industry. Sheesh, I’m having trouble accepting there are that many defenders of a government sponsored monopoly which artificially restricted supply and directly led to bad service and high prices. There was a recent NY Times article that chronicles the decline of the cab industry at the hands of Uber. I say good riddance. To summarize, NYC had a glut of cabbies in the Great Depression which depressed wages. The response to that was heavy lobbying from cabbies and the creation of a medallion system that a driver must buy or rent to work. The number of these medallions had been capped for decades at the insistence of medallion owners. Most drivers today can’t afford their own medallion as they’re owned by investors, and instead pay around $100 to rent one for a 12 hour shift. (Medallions as investment vehicles peaked in price at ~$1.3M a few years back). Of course, like any government sponsored monopoly, decades of this system led to high prices, poor service, dirty cabs and sketchy, unaccountable drivers. The situation was ripe for disruption, which Uber and other ride share apps have taken full advantage of. With Uber, I can summon a car in 2-3 minutes, and the vast majority of the time which will be clean, have a personable driver, and cost 1/2 what a yellow cab does. It’s a night and day difference from the consumer side as compared from the previous system of yellow cabs. I feel bad for the driver/investors who borrowed to buy a medallion and saw the value of their investment tank…but, making investments on margin is dangerous and nothing is a sure bet…that’s the real world. As for Uber drivers, they continue to drive willingly, and in this economy, there’s no shortage of other jobs out there. They’re free to get an education or work elsewhere, and they still drive for Uber. My Uber drivers have been very happy compared with my taxi drivers. And same with me. So many people prefer using “force” to ensure everyone else provides “help” versus simply allowing people to make choices. Like all businesses and other endeavors, there are people who make poor choices. When poor choices are subsidized through force, the additional money required flows to the people who orchestrate the system of force. Now if Uber relies on poor choices, their business will ultimately fail. The only way they can avoid that outcome is cronyism. So often companies will ultimately align with those promising to “help” through force. Buying “protection” has become the corporate norm. It’s all academic because once autonomous cars are introduced Uber will be out of business. The real purpose of Uber, and other money losing businesses like it, is to come up with an idea that’s good enough to convince yield hungry fund managers to “invest” with them so upper management can then skim off millions for themselves before they go out of business thereby stiffing anyone stupid enough to give them money in the first place. I think with Uber drivers the question is are they insured enough to cover their passenger(s). I am sure their auto insurance company would raise their premiums if they knew they were providing this service. More time on the road increases risk. Your policy says to and from work and for pleasure. That to and from work may be the sticky point. Could be denied coverage possibly. And if you use them and they are underinsured you will use your insurance. That is why they want to know if you have insurance. “… rendering the likelihood of such a transition on a par with Elon Musk actually colonizing Mars”. If you could measure self-promotion in yards, Elon has already made it to Mars and back. Perhaps travelling there in a miniature submarine. Noting Martian visas for diver hero “pedos” will be rejected. Oh dear, that’s not a crack in your facade is it, Mr Musk? …..IF and WHEN self driving cars are introduced. There is still not one single commercial self-driving car in commercial operation today. And there is not one self-driving car that has ever driver itself around chaotic city streets without a safety driver at the ready. I’m not totally sure SD are real yet or just “silicon valley vaporware”. There is A LOT that needs to happen before a Uber shows up to your house to take you to the airport with NO DRIVER. I don’t think a lot of folks that hype this tech have really looked into it. Below are just a few of the hurdles of widespread fully autonomous car adoption. More for you: Failure, Vandal or terror interference with GPS. In Ukraine Russia has deployed a cheap low power device that blocks GPS for 30 miles. Human road rage: In Italy every tenth of a second is fought for to the tune of a hundred horns. An SD car would be a lamb to the lions. Parking lot rage as the SD gropes around. Prediction: Walmart etc. won’t let them into reg parking. They’ll have a drop off zone like a bus stop. PS: good one re: terrorism. Now you don’t need to be a suicide driver. I have long wondered what will happen to these drivers when gas goes to $5-$7 per gallon. For the past 6 years, I’ve been Privately Growling at Uber’s predatory business model, pricing practices and taking 25% of the gross income from the drivers (who absorb 100% expenses for utilizing their car). Fast forward, with the NEW Uber ($200 Milllion Salary) at the helm (take heed to consider his karmic cultural roots and as a protege of Barry Diller), the secrecy of their internal financials and debt load — I sense an ever perpetuating cycle of slavery at the expense of the drivers in despair to make a living. PS: Henry Ford generously paid and treated his assembly line workers with respect. My taxi experiences over the years resulted in my ultimately taking a taxi when I had no other reasonable choice. My Uber experiences resulted in my taking Uber more and more frequently. And my drivers do fine on my rides considering gratuity. BTW, would like to see a study that compares riders who tip versus those who don’t. From what I seen, those who yell the loudest about “helping” people expect the help to come from people other than themselves, aka the “rich”. Also, the “costs” in these studies, which I have admittedly haven’t studied, are probably fully loaded. A rational Uber driver would focus on marginal costs. Vehicle selection, maintenance, replacement timing, etc are other areas that would enable some Uber drivers to perform better than others. A driver that doesn’t understand or learn these concepts quickly, is probably going to struggle in most pursuits. The Uber turnover is probably increasing more now because the economy has improved dramatically in a short period of time. Drivers have more options now. The automobile’s purpose is not to get you A to B but to put money into the pockets of the folks that own the auto industry. This is the reason why Uber/Lyft keep having to spend millions on advertising to intice people to drive for them. Their cars simply are not ment to run around for 8 to 12 hours a day. The Taxi industry has mechanics that keep their cars running that’s why the Taxi industry works and Uber/Lyft don’t, they lose money! Let’s junk the magical thinking here! Autonomous vehicles are not coming anytime soon or at least not the one you expect. Professor Andrew Ng, one of the founders of drive.ai, and a bonafide superstar in the AI community, admitted as much in a recent article at theverge. Basically the law will be changed such that if you hit any AI powered vehicles, it will be YOUR fault!! Uber is a goner if they can’t pass the right laws for their “autonomous” fleet. 1.) Eliminate the term “RIDE SHARE” since this is TAXI business. 2.) Eliminate the term “RIDER” because you are a customer. 3.) Eliminate all cars that don’t have commercial/taxi insurance. 4.) Eliminate all drivers that don’t have For Hire or Taxi license. Some data/app based companies have destroyed fair trade laws in this country and other. And suddenly consummers are trusting their lives to some teenagers that borrowed the car from their parents to make few dollars as a part time gig. WTF is wrong with all of you people? Uber presently pays 64 cents per mile in Houston. The vehicle depreciates at the rate of 56 cents per mile. .08 cents gross profit for driver. (This does not include other driving costs. SO WHERE IS THE PROFIT???? THERE IS NONE! DRIVERS LOOSE MONEY ON EVERY RIDE!!! I am disjointed with this site. As soon as I cited the rates paid to Uber drivers in Houston, it was taken eliminated. SO WHERE IS THE PROFIT FOR THE DRIVER?? ?, IF THERE ARE ALSO OTHER DRIVING COSTS THAT ARE NOT CONSIDERED IN THIS CALCULATION???? Your comment was not “eliminated.” It was your first comment on this site with this login, and so your comment went into moderation automatically to get approved. That’s part of the procedure for new commenters. Not everything is a conspiracy. Too much Brietbart or Alex Jones seems to be creeping into every day tasks. Being moderated keeps these comment sections civil-ish. Feel free to comment, just don’t go into Deep State conspiracy theories the moment you see your comment being moderated. Good information shared by the way, I fear those numbers are fairly accurate in a lot of areas.